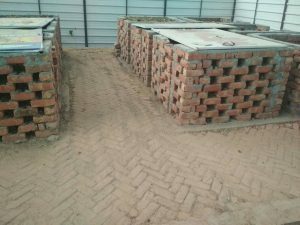 A Sanitation Park developed at Jind, Haryana, under a Pilot ‘No open waste (NOW)’ project covering 2 wards, aims to provide end-to-end treatment of waste generated by households, commercial units and institutions. The waste generated from the two wards is around 6.9 tonnes/day. First level of segregation is at the source (Household level) which is then collected by trained collection personnel in carts with separators, and transported to the sanitation park every day. The categories of segregated waste collected include biodegradable, recyclables (i.e. plastics, wood, metals, paper, paper board, glass, textiles, ash & dust, organic etc.) and non-recyclables (that includes medical / hazardous waste) waste. The biodegradable waste is converted into compost through decentralized composting units built at the sanitation park and may be used by the Department of Horticulture, Agriculture, and also by the residents. Recyclable waste is further segregated and treated at the unit and sold to potential buyers. The non-recyclable waste is safely disposed in a waste treatment plant located outside the city. At present, the Sanitation Park has 18 numbered composting pits, 2 segregation platforms,1 storage platform for recyclable waste,1 container for non-recyclable waste,1 water tank, 2 storage pits for dry leaves and cow dung, and 1 guard room. It is equipped with essential tools like weighing machine, wheel barrows, spades, shredder etc. Collected recyclables are being segregated and categorized further into 26 categories such as hard plastic, plastic bottles, plastics for packing, plastic caps, plastic glass, plastic spoons, plastic carry bags, polythene bags of different colors, polythene bags for milk, thick polythene bags, thin polythene bags, black polythene bags, glass bottles, broken glass, tin, tin caps, metals like iron, copper, brass etc., aluminium foil, rubber, leather, clothes, paper, hard paper board, paper box, cardboard, wood, E-waste, ceramics, newspaper, electrical waste, etc. These recyclables are being washed and stored in classified sacks and each sack is tagged with a name plate on it. The recyclables shall be sold out to potential buyers (junk dealers) through an e-auction. Beautification of the Sanitation Park is in process with landscaping and plantation, so that it looks attractive and becomes a learning hub for all sections of the society. Going forward, the model aims to be scaled up in other wards of the Municipal Council, Jind.